Work is done by a system on the surroundings if the sole effect on everything external to the system could have been raising a weight. The dashed line represents our system boundary (the imaginary surface that separates the system of study from the surroundings). The region of space inside the dashed line is our closed system and everything else is considered the surroundings. Confused and have questions? We've got answers. With Chegg Study, you can get step-by-step solutions to your questions from an expert in the field. If you rather get 1:1 study help, try 30 minutes of free online tutoring with Chegg Tutors. © B-Cubed, 2003, 2005, 2006, 2014, 2018. All rights reserved. Work is done by a system on the surroundings if the sole effect on the surroundings could have been raising a weight. Raising a weight is one way that a force can act through a distance. But, the key word in this definition is COULD. This means that the system you are studying does not actually need to move any weights in the surroundings. 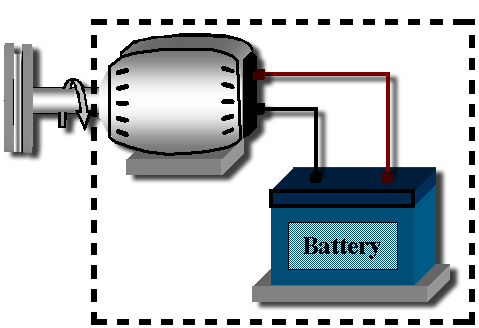 For example, if the battery shown here were our system, it would still be doing work on the surroundings because of the electrical current it drives through the wires. So, IF we connected a motor to those wires, it COULD lift a weight. Whether the electrical current in the wires actually lifted a weight doesn’t matter. This adds a great deal of flexibility to the definition of work. We can analyze and compare systems with mechanical or chemical or electrical processes using this definition of work. This is a very powerful way to define work. Next we need to decide whether the system is doing work on the surroundings or the surroundings are doing work on the system. Flip the page to look at this topic in more detail. Play File Your browser does not support audio playback.